Bill Wallace (born December 1, 1945) is an American martial artist who was a Professional Karate Association world full-contact karate champion. He was the Professional Karate Association (PKA) Middleweight Champion kickboxer for almost six years. Wallace was born in Portland, Indiana, and trained in wrestling during his high school years. He began his study of Judo in 1966 and was forced to discontinue his Judo related activities because of an injury he suffered to his right knee during practice. He then began to study Shōrin-ryū Karate under Michael Gneck in February 1967 while serving in the U.S. Air Force. After entering the point fighting tournament scene and achieving success there, he switched to full-contact competition. With the coaching help of veteran fighter Jim 'Ronin' Harrison, Wallace won 23 consecutive professional fights between 1974 and 1980, becoming the Professional Karate Association middleweight world full-contact karate champion and retiring undefeated. He was known for his fast left leg kicks, especially his roundhouse kick and his hook kick, which was clocked at about 60 mph. He focused on his left leg because of the Judo-related injury to his right knee, using the right leg primarily as a base. He also suffered the loss of one testicle during a point fighting tournament, when his protective cup was struck at an unfortunate angle. A year later, Wallace turned professional and captured the PKA middleweight karate championship with a second-round knockout. He relinquished the crown in 1980, undefeated. The PKA promoted the sport of full-contact karate. Full-contact karate differed from kickboxing in that leg kicks were allowed in kickboxing and forbidden in full-contact karate. It was PKA President, Don Quine, who coined the phrase "Superfoot" to describe Wallace after witnessing his fight first with Mark Georgantas and then with Jem Echollas. In 1990 Bill Wallace (166 lbs) fought one last exhibition kickboxing/karate match with friend Joe Lewis (198 lbs) on pay per view. Both Wallace and Lewis were refused a boxing license because of their age. The exhibition ended with one judge in favor of Wallace and the other two judges scored the bout a tie; ending the exhibition in a draw. Wallace has taught karate, judo, wrestling and weight lifting at Memphis State University. The author of a college textbook about karate and kinesiology, he continues to teach seminars across the United States and abroad. He has acted, most notably in A Force of One starring Chuck Norris. Wallace was the play-by-play commentator for the inaugural Ultimate Fighting Championship pay-per-view event in 1993 alongside fellow kickboxer Kathy Long and NFL Hall of famer Jim Brown. Wallace administers an organization of karate schools under his "Superfoot" system. He was elected to Black Belt Magazine's Hall of Fame in 1973 as "Tournament Karate Fighter of the Year" and again in 1978 as "Man of the Year." His film credits include A Force of One with Chuck Norris; Killpoint, with Cameron Mitchell; Continental Divide and Neighbors, with John Belushi; The Protector, with Jackie Chan; Los Bravos with Hector Echavarria; A Prayer for the Dying, with Mickey Rourke; Ninja Turf; and Sword of Heaven. 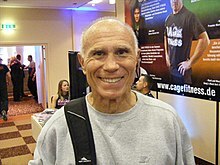 Bill Wallace was a personal trainer and close friend of both Elvis Presley and John Belushi. On March 5, 1982, Bill Wallace found John Belushi dead of a cocaine and heroin overdose, in his room in Bungalow 3, at the Chateau Marmont Hotel, on Sunset Boulevard, in Hollywood, California. Bill Wallace also starred in the 1985 James Glickenhaus action film "The Protector" alongside Jackie Chan and Danny Aiello. Wallace played a tough ex karate champ bodyguard (for a criminal boss), who has an extended fight scene with cop Jackie Chan in a Hong Kong warehouse. Win 20–0 Robert Biggs Decision June 8, 1980 12 2:00 Anderson, Indiana, USA Defends PKA Middleweight World title. Win 16–0 Daryl Tyler TKO July 18, 1978 6 Monte Carlo, Monaco Defends PKA Middleweight World title. Win 13–0 Emilio Narvaez Decision March 11, 1978 9 2:00 Providence, Rhode Island, USA Defends PKA Middleweight World title. Win 12–0 Burnis White Decision November 28, 1977 9 2:00 Honolulu, Hawaii, USA Defends PKA Middleweight World title. Win 11–0 Pat Worley KO October 8, 1977 2 Indianapolis, Indiana, USA Defends PKA Middleweight World title. Win 9–0 Ron Thivierge TKO May 21, 1977 6 Providence, Rhode Island, USA Defends PKA Middleweight World title. Win 8–0 Blinky Rodriguez Decision April 23, 1977 9 2:00 Las Vegas, Nevada, USA Defends PKA Middleweight World title. Win 7–0 Gary Edens Decision October 1, 1976 9 2:00 Los Angeles, California, USA Defends PKA Middleweight World title. Win 6–0 Daniel Richer TKO May 29, 1976 3 Toronto, Ontario, Canada Defends PKA Middleweight World title. Win 4–0 Jem Echollas KO March 13, 1976 2 Las Vegas, Nevada, USA Defends PKA Middleweight World title. Win 3–0 Joe Corley TKO May 3, 1975 9 1:31 Atlanta, Georgia, USA Defends PKA Middleweight World title. Win 2–0 Daniel Richer Decision September 14, 1974 3 2:00 Los Angeles, California, USA Wins PKA Middleweight World title. ^ a b Corcoran, John & Farkas, Emil (1983). Martial Arts: Traditions, History, People. Gallery Books. p. 392. ^ a b "Bill "Superfoot" Wallace". Fightingmaster.com. Archived from the original on October 4, 2011. Retrieved October 15, 2011. ^ "Bill Wallace IMDB Biography". Retrieved July 28, 2010. ^ Hayes, David (February 2017). "Bill "Superfoot" Wallace and the Taekwondo Connection". Taekwondo Life Magazine (3): 50. Retrieved January 16, 2017. ^ "Bill Wallace IMDB Listing". ^ "Bill Wallace's record at STAR". Starsystemkickboxing.net. Retrieved October 15, 2011. This page was last edited on 7 April 2019, at 09:34 (UTC).